Sometimes we can learn lessons from history–if we are paying attention. 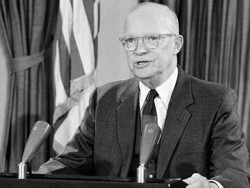 In January 1961, as he completed his second and final term as President of the United States, Dwight Eisenhower gave a farewell address to the nation. It was a remarkable and prescient speech in many ways, especially given that Eisenhower was a West Point graduate, a retired five-star general, a military hero in command of all Allied troops in Western Europe during World War II, and personally a very conservative man. In the speech, Eisenhower warned the American people of the growing power of a “military-industrial complex,” an alliance of the military with defense contractors that he saw as a threat to democracy. Democracy in the United States is now under a similar assault from an education-foundation-political-industrial complex. This complex takes many forms, but its primary goal is to shape state and federal educational policy in a way that maximizes private corporate profits. When a group of Indiana teachers surprisingly spoke out against seniority-based layoffs, it turned out they were recruited by a group called Teach Plus, which is largely financed by the Gates Foundation. The foundation recruits and pays Harvard-trained data specialists to work in school districts where they promote Gates Foundation initiatives. Harvard University received $3.5 million to place “strategic data fellows” who could act as “entrepreneurial change agents” in major urban school districts, including Boston and Los Angeles. In 2009, the last year for which tax records were available, the Gates Foundation spent $78 million on educational advocacy and another $300 million funding model Gates programs through 360 educational grants. Gates money is so pervasive that many recipients do not even know the origin of their funds, including the Teach Plus teachers. The American Enterprise Institute received a half a million dollars “to influence the national education debates,” and money went to Education Week and public radio and television stations that cover education policies. Gates Foundation money gets Gates Foundation opinions into the press, especially on the “Common Core Curriculum.” The Alliance for Excellent Education was paid over half a million dollars “to grow support for the common core standards initiative.” The Center on Education Policy received a million dollars to “track which states adopted the standards.” The Fordham Institute got almost a million dollars to “review common core materials and develop supportive materials.” When Fordham president Chester E. Finn Jr., praised the standards, he was quoted in newspapers across the country. The National Governors Association (NGA) played a key role, along with the Council of Chief State School Officers (CCSSO), in developing the “Common Core Standards.” It presents itself on its website as “the bipartisan organization of the nation’s governors” designed to promote “visionary state leadership,” and “best practices,” yet it is a virtual wholly-owned subsidy of the major education corporations. According to my calculations based on information from its website, in 2010 it received about a third of its operating budget, $7.5 million, from foundation grants and contracts, corporate fellows, and other contributions. The NGA and CCSSO have received millions of dollars from the Gates Foundation. Its over one hundred corporate partners include the Educational Testing Service, Apple, Pearson, Cisco, the College Board, DeVry, Houghton Mifflin, IBM, Intel, Microsoft and Scholastic, all companies that stand to benefit from its policy recommendations. Recent corporate award winners include Walmart (2011) Intel (2010), and Microsoft (2009). Wakelyn sent me an email objecting when, in a recent blog post, I identified him as a “corporate representative” whose appointment as deputy secretary for education “cemented” Pearson’s “ties with the New York State governor and the State Education Department.” Either he was unaware of the close ties between the NGA and Pearson and Gates while he was promoting the common core, or he does not see that as a corporate connection. While the National Governors Association wrote his checks, the money came from Pearson and Gates. Pearson advertises that it is “the world’s leading education company,” operating in more than sixty countries, although sixty percent of its sales are in the United States. Under the names Scott Foresman, Prentice Hall, Addison-Wesley, Allyn and Bacon, Benjamin Cummings, and Longman, it produces material for use in classrooms from “ pre-school to high school, early learning to professional certification” that help to educate more than 100 million people worldwide — more than any other private enterprise. In 2010 Pearson’s U.S. sales were $4 billion with an operating profit of $733 million. According to the New York Times, New York State Attorney General Eric Schneiderman is “investigating whether the Pearson Foundation, the nonprofit arm of one of the nation’s largest educational publishers, acted improperly to influence state education officials by paying for overseas trips and other perks.”Since 2008, state education officials have been treated to trips to London, Helsinki, Finland, Singapore, and Rio de Janeiro. The complex works in other mysterious ways. Sometimes corporations may not earn profits, but that does not mean their chief executives are performing a public service. According to the New Visions website, Robert L. Hughes was appointed president in 2000 and “under his leadership, New Visions has created 99 district and 2 charter public schools in New York City, provided mentoring services to hundreds of new principals, developed school-based certification programs for teachers and principals, and created an inquiry process now in use in 1,500 New York City public schools. New Visions currently is a Partnership Support Organization providing direct support to 76 schools serving almost 40,000 students.” Hughes, an attorney with no actual background working in schools, was paid $358,525 by New Visions in 2010. That is forty percent more than the salary paid to the current schools chancellor – who supervises the entire school system — and the money allotted to pay the Mayor of New York City. Other people simply go back and forth between the corporations, foundations, and government. Karen Cator is the Director of the Office of Educational Technology at the U.S. Department of Education. Prior to this Cator worked for Apple, where she focused on “the intersection of education policy and research, emerging technologies, and the reality faced by teachers, students and administrators.” Before that Cator she served as Special Assistant for Telecommunications for the Lieutenant Governor of Alaska and served as chair of the Partnership for 21st Century Skills, a national organization that advocates for educational readiness. It was very difficult to find information online about Mark Nieker, the president and executive director of the not-for-profit Pearson Foundation. Nieker oversees Pearson’s philanthropic activity worldwide. However, prior to heading the Pearson Foundation, Nieker held executive positions in Pearson businesses in the United States and worked in Microsoft’s Consumer Publishing Division, both “profit-making” positions. The education-foundation-political-industrial complex producing this dystopian educational future includes some of the great names in the contemporary school reform movement. Apple and PC computer makers and marketers, who have been donating the last generation of technology to schools as a tax right-off, a form of product placement, and to build brand loyalty, will cash in by selling a new wave of hardware. Bill Gates’ Microsoft will be generously promoting their software. Bloomberg LP and Murdoch’s News Corp, where Bloomberg’s former educational czar now resides, as well as the publishing giant Pearson, will be producing, pruning, and pushing carefully pre-digested “information” along with their own information technologies. This corporate sponsored educational reform movement is also an anti-union and an anti-government movement because the unions will have to be broken for them to put their plans in place and various levels of government will have to abandon their responsibilities and turn the school systems over to private interests. With government and the unions out of the way, kids can absorb whatever the corporations decide to provide without any interference. This piece was earlier published at L.A. Progressive.